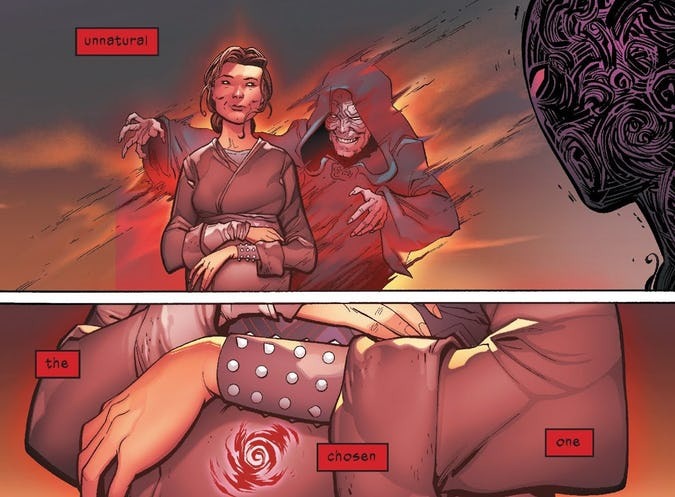 Looks like the long standing rumor has officially been confirmed as canon in last week’s Darth Vader # 25 by writer Charles Soule and artist Giuseppe Camuncoli. In this week’s issue, Darth Vader’s soul goes on a trip to the not-so-afterlife where he meets the people in his past both good and bad that shaped his life in one form or another. And then comes the most crucial part, finding out his parentage. We all know that there was no father per se when Shmi Skywalker conceived Anakin. She let that fact known when Qui Gon Jinn showed interest in taking the boy with him to train under the Jedi order. In Darth Vader # 25, Vader finds out through some sort of vision who his “father” is. And his name was Anakin Skywalker. Lets look at that panel one more time. Darth Vader # 25 is out now in your local comic shop. We highly recommend this title folks.